Well the author has returned from her vacation and it's time to catch up on the news! Several interesting this have happened/are happening this month so I'd like to speak about some of them here. The first interesting bit of news has to do with the Japanese dock that found its way to Agate Beach in Newport, OR (see previous posts). As of the first week of August, a salvage company (Ballard Diving and Salvage) was contracted to remove the 188 ton dock from the beach. Cranes and industrial sawing equipment were used to cut the dock into 5 separate pieces to be hauled back to Portland. While the salvage company now owns the dock, a small section on which a mural had mysteriously appeared will be saved and added to a memorial that is planned to be built on the grounds of the Hatfield Marine Science Center in Newport, OR. 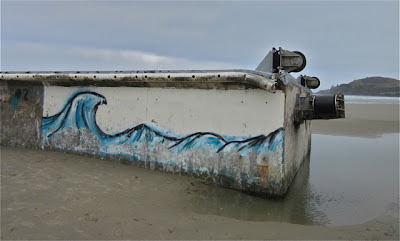 Wave mural that appeared on the dock before it was deconstructed- this section will be made part of a planned memorial. What is to become of the other 4 pieces? They are planned to be turned into road paving materials. It's a weird end of the line for such an interesting and somber item, but I supposed there is not much else that could be done with it. 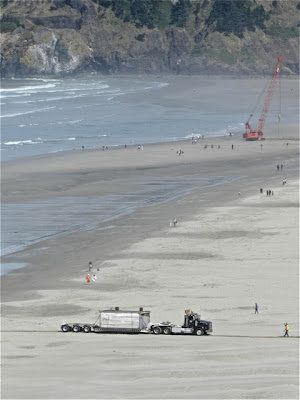 In other news, a decrease in debris has been noted off of the coast of Washington and Oregon, most likely due to very low winds throughout the summer season so far. As noted in previous posts (The Mechanics of Drifting on the Open Sea), very light debris has already mostly arrived, and the heavier debris will likely take a few more months to show up. In late July, there were reports of a 26x16 foot barge-like object floating approximately 25 miles off the coast of Washington. The state monitored it for a short period of time before it dropped off of the radar. It seemed that the object has either sunk or gone out of range- it may be interesting to see if it makes a reappearance in coming weeks!